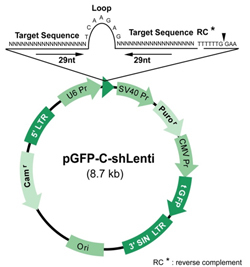 pGFP-C-shLenti vector: pGFP-C-shLenti vector is a third generation Lentivector which requires the viral components carried in other vectors to produce viral particles. There are three major functional elements within the 5LTR and 3LTR: a shRNA expression cassette driven by an U6 promoter, a puromycin resistant gene driven by a SV40 promoter and a tGFP gene driven by a CMV promoter. All of them can be packaged to viral particles and transduced to many cell lines. The bacterial selection marker for the vector is Chloramphenicol. 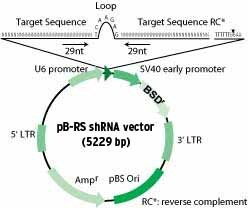 For our RNAi products, the shRNA expression cassette consists of a 29 bp target gene specific sequence, a 7 bp loop, and another 29 bp reverse complementary sequence, all under human U6 promoter. A termination sequence (TTTTTT) is located immediately downstream of the second 29 bp reverse complementary sequence to terminate the transcription by RNA Pol III. The gene-specific shRNA cassette is sequence-verified to ensure its match to the target gene. 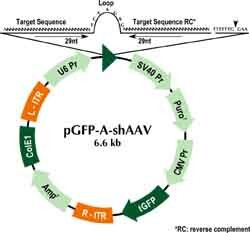 pGFP-A-shAAV vector:The pGFP-A-shAAV vector was created with an integrated turboGFP element to readily verify transfection efficiency. It incorporates both a ampicillin and puromycin resistance elements for greater selection capabilities. The AAV2-backbone vector enables the helper-free packaging method to produce AAV particles. pGFP-V-RS vector: The HuSH pGFP-V-RS plasmid vector (Figure 1) contains both 5?and 3?LTRs of Moloney murine leukemia virus (MMLV) that flank the puromycin marker and the U6-shRNA expression cassette. Upon transient transfection of the plasmids into a packaging cell line, replication deficient viruses can be obtained and used to infect target cells. The puromycin-N-acetyl transferase gene and Kanamycin gene provide selection of antibiotics puromycin and kanamycin, respectively. There is an integrated turboGFP element driven by a cMV promoter to readily verify transfection efficiency. 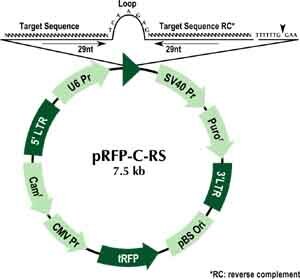 pRFP-C-RS vector: The HuSH pRFP-C-RS plasmid vector (Figure 2) was created with an integrated turboRFP element to readily verify transfection efficiency. It incorporates both a chloramphenicol and puromycin resistance elements for greater selection capabilities. The pRFP-C-RS plasmid is also ideal for monitoring the dual-gene knockdown experiments when used alongside pGFP-V-RS expression plasmid. pRS vector: The HuSH pRS plasmid vector (Figure 3) incorporates all the elements as above two vectors with the absence of a fluorescence marker. The bacterial selection marker for pRS vector is ampicillin and the mammalian selection can still be achieved with puromycin. 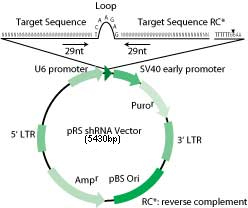 pGFP-B-RS vector: The HuSH pGFP-B-RS plasmid vector (Figure 4) offers the same elements as pGFP-V-RS vector with an exception of an alternative mammalian selection marker. The substitute feature of using blasticidin selection instead of puromycin, which is available in all of our retroviral vectors assists researcher in creating stable cell lines in double knockdown experiment. Visit stable cell lines in double knockdown experiments to learn more..
pB-RS vector: The HuSH pB-RS plasmid vector (Figure 5) incorporates all the elements as the pRS vector with blasticidin in mammalian selection instead of puromycin. pRFP-CB-shLenti vector: pRFP-CB-shLenti vector is a third generation Lentivector which requires the viral components carried in other vectors to produce viral particles. There are three major functional elements within the 5LTR and 3LTR: a shRNA expression cassette driven by an U6 promoter, a blasticidin resistant gene driven by a SV40 promoter and a tRFP gene driven by a CMV promoter. All of them can be packaged to viral particles and transduced to many cell lines. The bacterial selection marker for the vector is Chloramphenicol. Additional control vectors are available and can be purchased seperately.